The Hunter Valley Gardens Christmas Lights Spectacular this year is promising to be bigger than ever with 1.5 million lights on display and Mercure Hunter Valley Resort is right where the action is. A special 'Hunter Valley Christmas Lights package' is now available which includes overnight accommodation, full buffet breakfast and entry to the Christmas Lights Spectacular for two adults and two children. Rates start from $289 per night weekdays for stays between 7 November and 23 December. Terms and conditions apply. Rates start from $899 per package for a twin share studio room and two night's minimum stay. Terms and conditions apply. 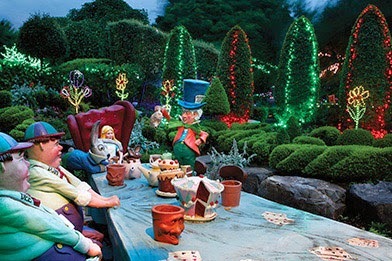 The Hunter Valley Gardens Christmas Lights Spectacular will be the biggest display of its kind in Australia and will feature an array of fantastic activities including fountain firework lights, a larger than life nativity scene, children's entertainment and Santa Claus will of course make an appearance. New features include Cinderella's Castle, a Light's Spectacular marquee, underwater light display as well as a display train. Located just footsteps away from this magical wonderland, Mercure Hunter Valley Resort offers a range of accommodation styles including studio suites, garden studios, spa rooms, and family rooms. Leisure facilities include tennis courts, a heated pool and spa, games room, day spa and lounge library with pool table. The hotel is within walking distance of half a dozen wineries and the Roche Wines cellar door, with McGuigans Winery and The Cheese Factory right on the doorstep. For bookings, visit www.mercurehuntervalley.com.au or call (02) 4998 2000.